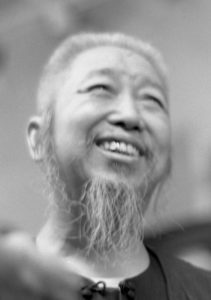 Professor Cheng Man Ching (1900 – 1975) learned Tai Chi Chuan in the tradition of the classical Yang style from Yang Chengfu in Shanghai. There he was close friends with Ma Yueliang, the representative figure of the new Wu style. After the death of his teacher Yang Chengfu in 1935, and with the permission of Chen Weiming, a student of Yang Chengfu, and his father Yang Jianhou, Cheng Man Ching developed the so-called “short form”, in which 37 positions are counted, from the the well-known long form with 85 or 108 positions, depending on how they are counted. This form was intended to be easier to learn, and to contribute to improving the health of the people in view of the poor standard of medical care. Even today, proponents of the classical Yang style are critical of this innovation, although in the meantime so-called short forms have developed in the classical styles, too. The changes Cheng Man Ching made to the Tai Chi form developed by Yang Cheng Fu clearly differ in appearance and execution. 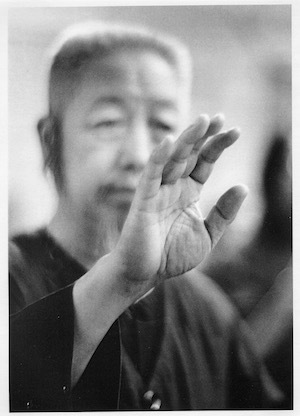 Whatever his reasons for developing the short form from the long form, no one disputes that he was an outstanding teacher and master, not only in Tai Chi Chuan.The history of Tai Chi Chuan shows that the forms being practiced were subject to continuous change. Therefore it is certain that one can discuss “tradition” and “authenticity” endlessly, without ever reaching a consensus. The essential and unifying principle, upon which many who practice Tai Chi Chuan seem to agree, is the desire to penetrate the depths and “secrets” of Tai Chi Chuan and taoism. Just as there is certainly no specific Tai Chi Chuan gene, that determines the progress of the individual in this art, the goals, too, of individual students differ greatly. Since Cheng Man Ching was an “outsider”, i.e., not a member of the Yang family, he was frequently subjected to hostility and disparaging remarks about his development of the short form (37 positions). Just as older generations frequently criticize changes in values, this seems to be an expression of the eternal alternation of yin and yang in history. In any case, from a modern medical perspective, the variant of the form as practiced in the tradition of Huang Shen Shyuan (1910 -1992 Malaysia) and his student Patrick Kelly (Neuseeland) – which I practice and which I’d like to discuss – shows very interesting parallels to modern therapeutic methods in sports medicine and physical rehabilitation. For example, this form is especially suited to training the principle of “vertical posture” (Chinese: the relationship of heaven and earth). Naturally, one can practice vertical posture, which refers to the entire physical context and not merely spatial verticality, in other forms, for example, in the old Yang style, which is practiced in a forwardly inclined posture. Nonetheless, from a medical point of view, practicing the vertical form seems to represent a greater challenge for the interaction of the legs, hips, sacrum, and lumbar vertrebrae, with respect to fine angular adjustments. Only at first glance does the Swiss neurologist Dr. Alois Brügger’s holistic and functional concept of motion, developed in the 1960s, contradict the conception of posture in Tai Chi Chuan. The schematic diagram of the three gears, that stand for the regions pelvis/lumbar vertebrae, thoracic vertebrae, and cervical vertebrae, shows a different back position than the flatter position of the pelvis and lumbar vertebrae, frequently aspired to in Tai Chi Chuan. However, if one considers the functional aspect in the interaction of these gears, it merely demonstrates clearly their interaction in these regions. It is the very same functionality that is shown. Since in Tai Chi Chuan, we are always concerned with motion and alignment, there is no genuine contradiction here, but merely a different way of describing the phases of motion. In fact, there is no single correct posture for the pelvis and the lumbar vertebrae, but only a functional interaction of these two regions. In addition, the Cheng Man Ching form contains principles of osteopathy, which is becoming better known in Europa. Among other things, the term “tensigrity” (from “tension” and “integrity”), which describes the total tension in the body and the reciprocal effects resulting from the loss of even apparently minor elements of the bodily system. The changed position of the hands in Cheng Man Ching’s Tai Chi Chuan compared to that used in the old Yang style, makes complete alignment up to the fingers possible, uninterrupted by an abrupt bend in the wrists. By this means, power from the feet, steered by the waist, can reach all the way to the hands, through which, as extensions of the lower arms, the power can be transmitted. Trying to transmit power with bent wrists frequently leads to coarse shoving with the palm, which is only apparently more powerful, and leaves one’s partner with the feeling of the pressure of one’s hand on his body for a long time. The unbent hand position makes it possible to concentrate on practicing elasticity by means of yielding, neutralizing, and issuing. When one is unsuccesful, it prevents one from striking with the palm. By means of the clear distribution of weight and the differentiation of “full” and “empty” in combination with the motion of the torso, steered by the waist, it is precisely the vertical posture which one uses to work on activating the muscles responsible for support and movement. In this way, practitioners of Tai Chi Chuan can improve the common general muscular weakness of the systems of support and motion by stabilizing the axis foot- knee-hip. This is known in sports medicine and physical therapy as the improvement of the muscular “loops” or the interaction of the chains of muscles. Even though the movement of the torso, steered by the waist, mentioned above, is not a way of practicing specific to Cheng Man Ching, it is closely related to the even less familiar concept of “spiral dynamics”, by means of which one practices three-dimensional movement about a center. Here, too, the push is not a strike with the hand, but rather the transmission of the power of the en- tire body through the hand. Concepts from manual medicine and osteopathy such as “myofascial release”, “eccentric muscle action” from muscle physiology, and the proprioceptive training of support and target motorics must certainly seem strange to practitioners of Tai Chi Chuan. Nonetheless, these terms are not just modern and common parlance in current therapeutic practice, they also confirm what old masters have obviously understood and practiced for a long time. But this shouldn’t merely be understood as confirmation of the principles of motion, but also as the continual change of the Dao, which here, too, ties the worlds together in the sense of yin and yang. These brief and incomplete remarks are meant to pay homage to the extraordinary achievements of Cheng Man Ching with respect to spreading Tai Chi Chuan and its principles througout the world. His own thoughts on the matter remain a mystery. In any case, his work, directly and indirectly, has greatly influenced the links between East and West, and has done much good, not only for the people living here.